Just tell me a good story Mr. Moviemaker, it's really not too much to ask. While you're at it go ahead and challenge me by making that story just a little different than the other ones out there, teach me something I didn't know before and make me feel an emotion - any emotion. You don't need to blow up a bunch of stuff (although sometimes it does make the story more fun) or spend a billion dollars making your point - just spend some time telling me a good story and that will make all the difference. The tale of Jamaal (Dev Patel) aka the Slumdog and how he just might become a Millionaire is a good example of how to by make a very special Bollywood movie by someone who has no experience in how to do so - but who does know how to tell one heck of a story. Danny Boyle has directed two of the most original and exhilarating movies of the past few years with 'Trainspotting' and '28 Days'. And if you can make movies about drug abuse and zombies (respectively) a movie experience, by all means then, go ahead and try your hand at a movie about - street children, orphans, religous riots, lost (and found) love, crooked cops & even crookeder criminals and last but not least - game shows. If you don't know how in the world anyone could have possibly made a movie about all this and have it ALL MAKE SENSE then watch this little independent movie that is the current darling of the awards circuit. Winning the Golden Globe for best drama, best director, best screenplay and (drum roll please) - best original score for the maestro A.R. Rahman - who became the first Indian to win the prestigous prize. The awards will most likely continue to pile up as it has been nominated for 11 awards at the BAFTA's - the British equivalent of the Academy Awards - and is all but a shoo in for the Oscars themselves. Danny Boyle did his homework and watched a slew of Bollywood gangster movies to get a feel for the genre. Indeed, he called out 'Deewaar' (1975),one of my all time favorite movies, as being 'absolutely key to Indian cinema'. With all the accolades being heaped on this movie the only thing I was worried about was the possible backlash about how India is portrayed in the movie like this rant from the Big B himself. Considering he is so prominently figured in one of the movie's key scenes I am somewhat taken aback by his reaction to it. Bombay is one of the greatest cities in the world and this movie portrays it in one of the most honest ways I have ever seen it done so. We get enough of celluloid eye candy from the glorious musicals that Bollywood pumps out year after year - a movie or two that shows us the seedy underbelly of the city is refreshing (if somewhat unsettling) as well. A friend of mine called me after watching an advance screening and asked me 'What would you do for an autograph of Amitabh Bachchan?' and then told me I had to go see this movie. Indeed, when I saw what our protagonist Jamaal is willing to do for the autograph I instantly knew that the makers of this movie 'got it' when it came to Desi culture. The soundtrack boasts many great tracks that represent the first collaboration between A.R. Rahman and the Sri Lankan born singer M.I.A. They were both mutual fans of the other when the director of the movie introduced the two and challenged them to provide a soundtrack that was as frenetic as the city itself. The result is a product that helps move the story along at a breakneck pace but slows down the action when needed. Today's selection is Ringa Ringa which is played when Jamaal and his brother Salim go looking for Latika (Freida Pinto) in the city's notorious red light district. If the song reminds you of Choli Ki Peeche it's because it was sung by the same two singers as that classic Bollywood tune, Alka Yagnik & Ila Arun. *Evdience that 'Slumdog Millionaire' has already achieved success in the US that is usually reserved for Hollywood productions - the yellow scarf that Freida Pinto is wearing in the movie has been on the 'must have' lists in many a gossip rag. Adding to the mystery of the movie, the wardrobe designer says it was a one of a kind piece that would "bookend the journey--to tie her childhood yellow dress to her final look". 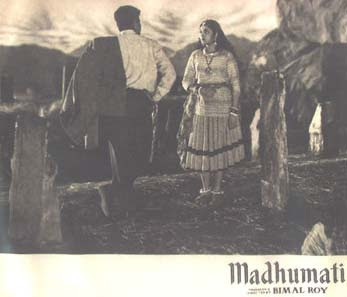 "On a dark and stormy night" is how Madhumati begins and director Bimal Roy sets a dreamy yet uneasy mood so well that the audience follows with a feeling of nervous excitement through the rest of the movie. Indeed the movie holds up well nearly half a century later because of the concerted efforts of it's makers, stars as well as it's unforgettable soundtrack. Madhumati was well rewarded for it's efforts with nine Filmfare Awards, commercial success and was a darling of critics as well. It was Roy's second win in the short life of the Filmfares as he had also won best director in the inaugural Filmfare Awards in 1953. Technically speaking it is not as polished as the films of today for obvious reasons but watching legends such as Dilip Kumar & Vyjayantimala on the screen together are worth the time invested viewing on their own. Add to that the breathtaking scenery (even in black & white), the original story with a Sixth Sense like twist at the end and the pitch perfect soundtrack and this movie becomes a must watch for Bollywood fans both new and old alike. The jewel of this movie however is the soundtrack. Salil Choudhury triumphs as the music composer in what is considered his finest and most commercially successful movie. 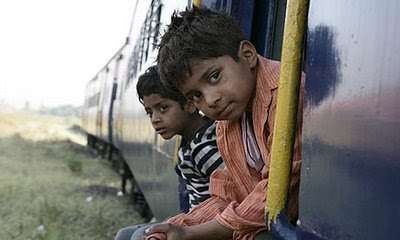 He grew up in the tea growing state of Assam and spent many a day in his youth trekking with his forest ranger father. Madhumati is said to have been an ode to that time in his life and the songs match the story of the forest maiden and her Prince Charming rather well. In fact the entire movie's mood and ambiance is framed brilliantly by it's editor (Hrishikesh Mukherjee) who not only won a Filmfare Award for his efforts but also became a celebrated director in his own right. Lata counts Aaja Re Pardesi as among her ten best recordings ever and earned her first statuette with her rendition of the song . "I love all the songs of Madhumati but this one was special and I still remember how happy everyone was on the day it was recorded. Lyricist Shailendra gave me flowers and then Bimal Roy himself came forward to congratulate me! The song was beautiful and it was such a big hit too." The three songs for today include the aforementioned Aaja Re Pardesi, Bichua and my personal favorite - Zulmi Sang Ankh Ladi. Below are the videos of the songs and following them are screencaps from the movie with commentary. On a dark & stormy night Devendra (Dilip Kumar), an engineer, is traveling with a friend on a lonely highway to pick up his wife and child from the railway station. A landslide blocks their path and the two take shelter in an old mansion nearby. Devendra finds the house uncannily familiar and in the large front room he finds an old portrait which he recognizes. His friend and the old caretaker join him, and Devendra, amidst flashes of memory from another life, sits down to tell his story while the storm rages outside. Like his Hollywood counterpart Cary Grant, Dilipsaab was class personified and was devastatingly handsome to boot. Comedian Johnny Walker (who took upon the name of the scotch favored by the British Raj during their time in India) provides the comic relief as the assistant to Devendra. Most roles he undertook required that he be intoxicated at least some of the time, I don't recall him ever being sober through a whole movie. I love the way the audience is introduced to Madhumati (Vyjantimala) - as Anand (Dilip Kumar's character in the flashback) is looking for the woman behind the enchanting voice he keeps hearing during his time in the forest. The mountain mist parts to show her to us and him for the very first time. This film rocketed her to the top tier of Bollywood's stars and earned her the Filmfare Award for best actress not only for her acting but for her formidable dance skills as well. We come to find out that the young forest maiden lives alone in a log cabin with her Paul Bunyan-like father and he is an imposing figure indeed. Anand not only proves his mettle by sneaking into her house to meet her during the evenings but also wins over dear old dad who has a centuries old feud with Anand's employer. Ugranarayan (Pran) is the zamindaar (landowner) who is Anand's boss and in addition to having a very intense name is also a ruthless and arrogant man. Anand refuses to bow down to him and has a showdown with him that unfolds in the film's climax. 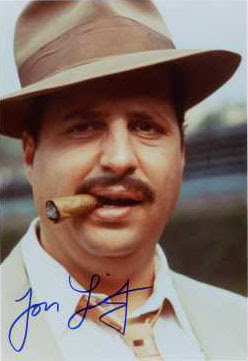 Is is it me or does Pran look an awful like actor Jon Lovitz? And why do zamindaars in Bollywood always have to be so evil? The foreshadowing in the bichua (scorpion) song that takes the movie into it's second act. As stated earlier, the director's deft hand gives the movie an eerie mood right from the beginning scene and never really lets the audience feel comfortable with what is happening on screen even during the romantic scenes. We know that something terrible is coming but the way the plot finds it's way to a satisfying end makes it all well worth it - even 50 years later.